Whether with a laptop and webcam, or via complete immersive projected 3D worlds using depth cameras such as the Kinect, PS3I and Xtion, robotics engineer Lorne Covington makes real-time responsive environments using vvvv, midi, OSC and more. 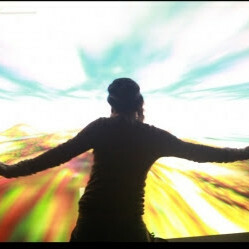 Lorne's installations move in time to music, allow participants to use their bodies to create music and visuals. Lorne has exhibited at the Rochester Museum and Science Center and was a finalist at the 2012 GECCO Evolutionary Art, Design and Creativity Competition. His work has been featured in performances at the JFK Center for the Performing Arts in Washington, DC.